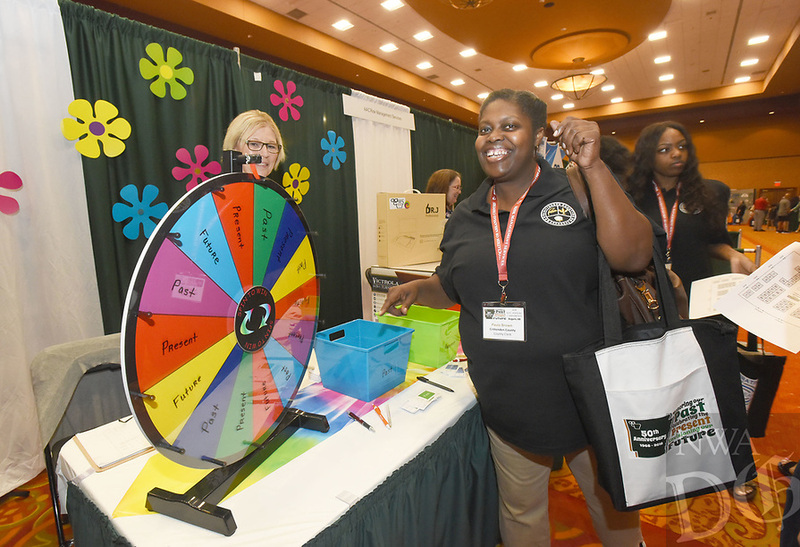 Paula Brown, Crittenden County clerk, celebrates winning a prize on Wednesday Aug. 8 2018 during opening day of the Association of Arkansas Counties conference at the John Q. Hammons Center in Rogers. Officials from counties around the state opened the conference Wednesday with vendor exhibits and samples, breakfast and breakout meetings for various posts in county government such as county judges, sheriffs and assessors. The conference continues through Friday. U.S. Rep Steve Womack (R-Rogers) addressed the conference Wednesday. Gov. Asa Hutchinson will speak at 9 a.m. today. Aliyah was at the conference with her grandpa, James Ross of Miller County.